The first time I tasted an avocado was in 2009 when I visited California. I loved the buttery flesh of the fruit and the fact that my best friend, who I was meeting after almost a decade, was carving it for me, eternalized the memory. I came to associate Avocado with Nostalgia. I tried the local avocados a couple of times, but I was naive. I didn't know how to choose an avocado, so I ended up choosing raw ones all the time and was dismayed to find them rock hard when I tried to cut through them. Why did Avocados available in India behave so differently from the one that was sliced easily by my friend in California? I wasn't able to solve the mystery. So when my husband told me about this event at New Zealand High Commission that was all about Hass Avocados from New Zealand, I was intrigued. May be this is where I would find my answers. 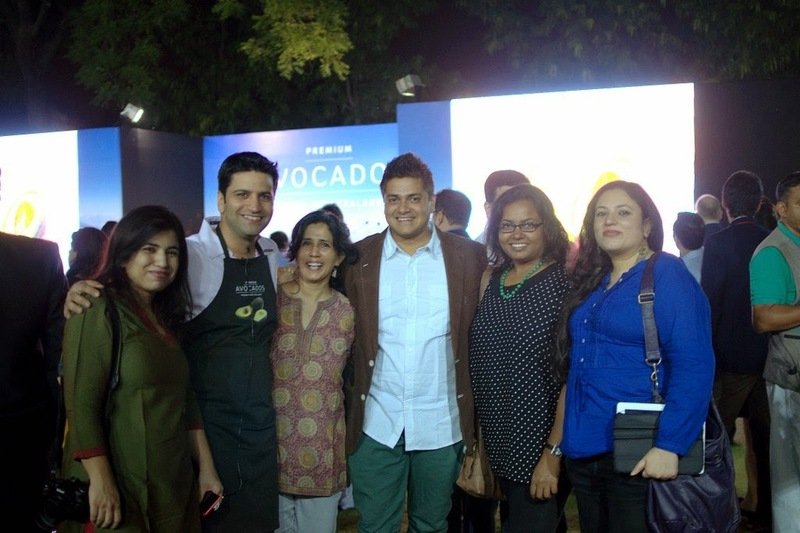 The fact that the event would be graced by the likes of Chef Kunal Kapoor and Chef Saby was a bonus. 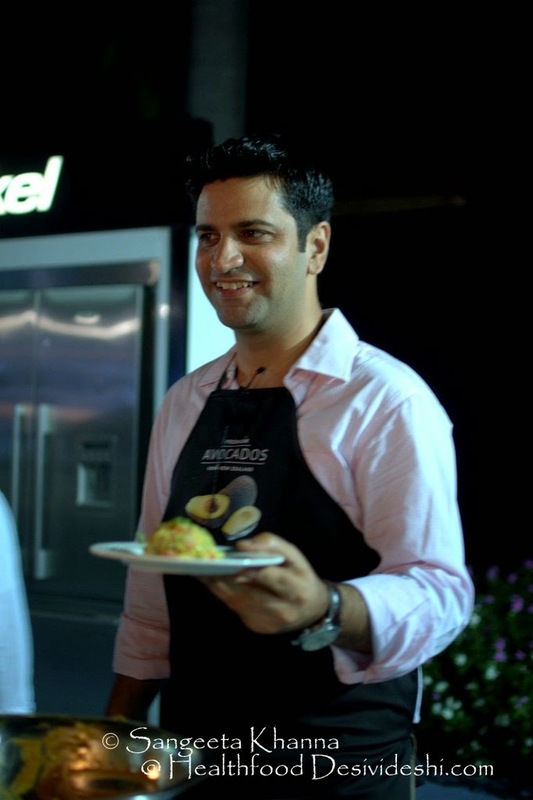 The icing on the cake really was that we would get to taste food prepared by Chef Kunal. I also finally came to know of all the answers to my questions. An avocado has a buttery texture when it is fully ripe. And a fully ripe avocado will be dark purple in colour. There is also a special technique to cut an Avocado. Slice the fruit in half vertically. Twist one side so that it comes out clean, leaving the seed inside the other side. Dig the knife into the seed and then twist it. The seed will separate from the flesh and then you can peel the skin off quite easily. I was fascinated and wanted to demonstrate this beautiful technique to my family. They were suitably impressed, and then I did the unthinkable. I cut the fruit and offered them a slice each without any seasoning. They grabbed it quite enthusiastically, but their enthusiasm lasted till they took the first bite. Then they respectfully returned all their slices to me. This was my third lesson with regards to the Avocados. Never offer them to people who haven't ever tasted them without any kind of seasoning. 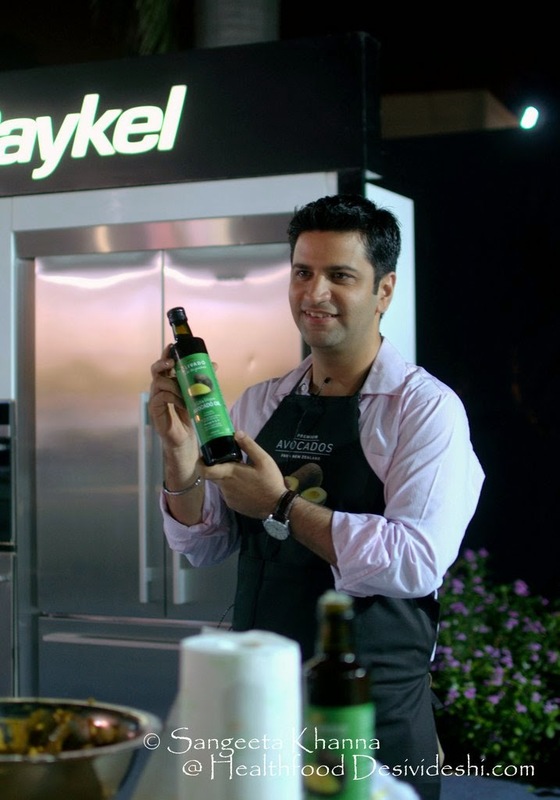 Chef Kunal Kapoor, on the other hand, was much more sensible in his handling of Avocados. He used them with Sev in Sev Puri, in parathas, and in a moily curry. And all his preparations were well appreciated by the guests. Apart from this, we also tasted Avocados in Sushi, in tarts, in puffs, and also in some India deserts such as Kulfi and Kheer. And all of them tasted yummy. Things got a bit out of hand when I ate a spoonful of a green paste assuming that it was an avocado puree. But it turned out to be wasabi. You can well imagine the state I was in after that. My eyes watering, smoke coming out of my ears, feeling quite like a steam engine. The event on the whole was great, and we got to come back with a sample each of a Hass Avocado. It was also a great occasion to meet the talented food bloggers Sangeeta Khanna and Deeba, and of course the always humble Arvind Khanna. I thoroughly enjoyed myself. Yes, even the wasabi episode. 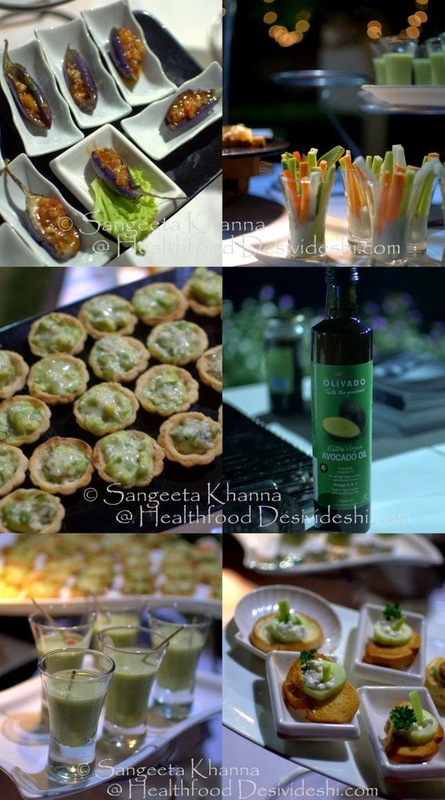 If you want more information about this event, here is the blog by Sangeeta Khanna.